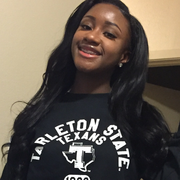 Hello, my name is Artnisha Gibson, I attend Tarleton State University for my Bachelor's degree in Nursing. I am currently in Amarillo for the remainder of summer. Over the school year, I work as a Student Aide at the Middle school there. I worked with many children from disabled to very smart. I offered to tutor after school to those students who couldn't understand certain material during class. I've taken care of those with learning disabilities or the irritability to remain calm. I can care for children from 5 months. I babysat my nieces who are between the ages of 3 months and 3 years of age. Artnisha doesn't have any reviews yet.